William Powhida's caucus results have been posted. 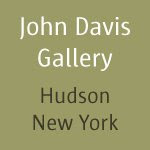 It was a nasty contest, but evidently there is no problem of racial division in the New York artworld. 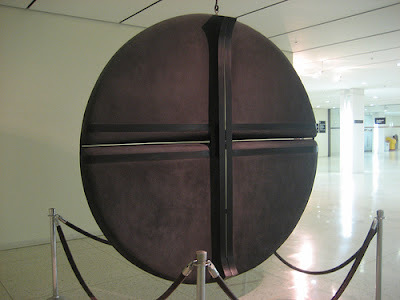 This James Wines sculpture - Grey Disc, 1968, painted cement and steel - is another of my favorites from the concourse underneath Empire State Plaza. Grey Disc at Empire State Plaza is almost like a proto-Sculpture in the Environment piece.... perhaps the experience of placing his piece within the Rockefeller/Harrison context contributed to ideas leading to the founding of SITE two years later. SITE is maybe BEST known for the nine BEST Products showrooms, commissioned by BEST art patrons Sidney and Frances Lewis... here is some more info on those buildings. 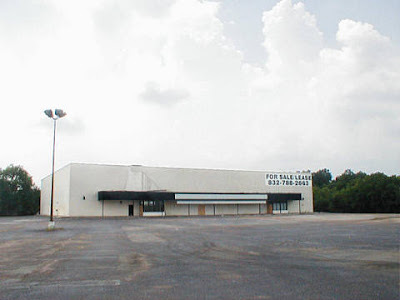 BEST Products has gone out of business, and all but one of SITE's BEST buildings has been destroyed... the overgrown and grassy Forest Showroom is now a church. 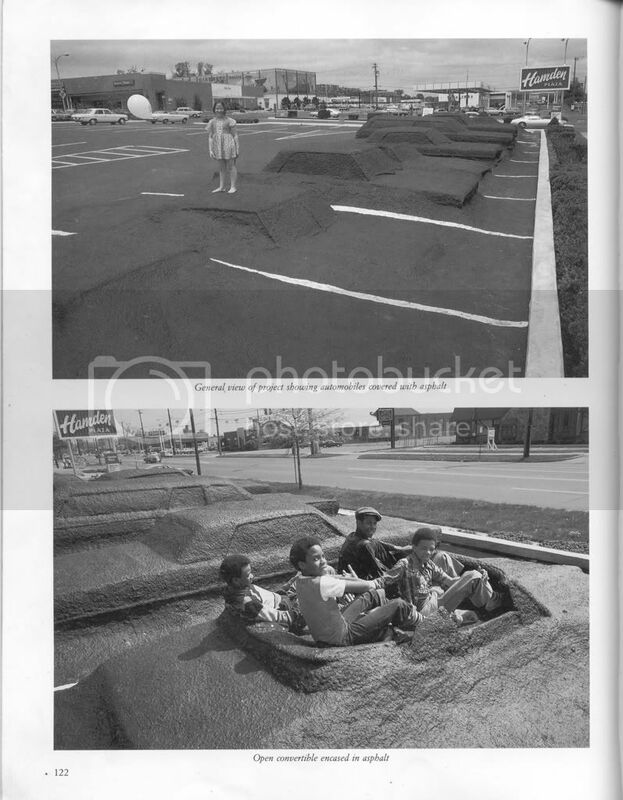 Ghost Parking Lot, 1978, commissioned by the Hampden Plaza shopping center. 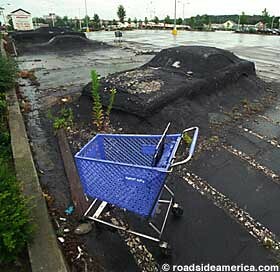 Here is what it looked like when it was still new, and here is a gorgeous photo taken in 2002, shortly before it was destroyed. 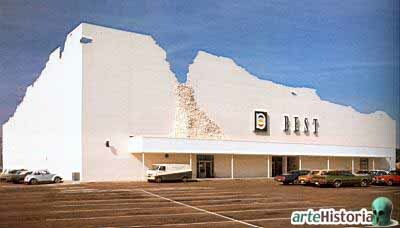 Indeterminate Facade Showroom, 1975 - everybody who has been to art school in the past thirty years is familiar with this building. Indeterminate Facade Showroom today. This photo was taken from Diebold Essen's Magellan's Log, where you can see that in this panoramic photo taken in 2002 (scroll right) the original architecture was still extant. James Wines more recently did the Shake Shack. RELATED: God Bless Sidney and Frances Lewis. RELATED: 1983 Time article on James Wines and SITE. He's good. WHO COULD IT BE? Oh, here is a walter10021 commenting on an article on De Montebello, quoting Artnet... and another commenting on the blog of Artnet editor Walter Robinson's brother, Greensboro News & Record editor John Robinson. 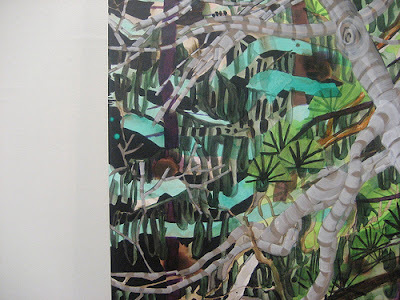 Tyler Green has a good three-part interview with Village Voice art critic Christian Viveros-Faune (part one, part two, part three)... DON'T skip part three, and definitely read Tyler's final thoughts. It is kind of funny now to read this 2004 nickname I gave Viveros-Faune. 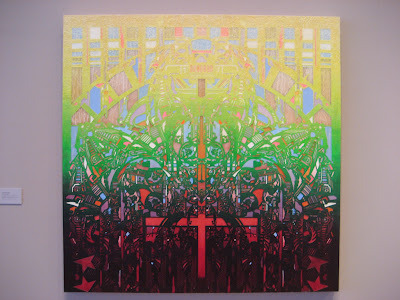 RELATED: Gallerist Edward Winkleman on Christian Viveros-Faune, last year. RELATED: links to people responding to Tyler's posts. IMMEDIATE UPDATE: Editor Tony Ortega announces that Christian is no longer writing art criticism for the Village Voice. 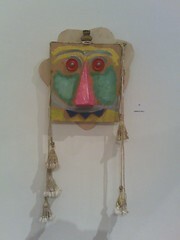 Lane Twitchell at University Art Museum, in Albany. 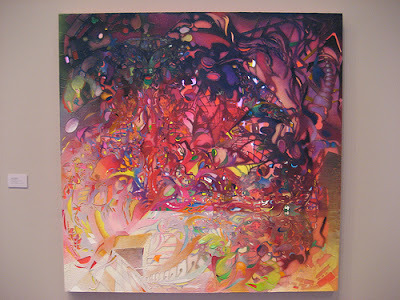 RELATED: Judith Linhares at University Art Museum, James Siena at University Art Museum, Mr. President, at University Art Museum. 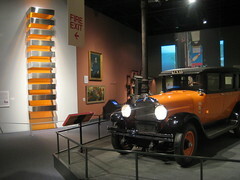 "I'd been looking forward to reviewing the San Jose presentation of show. 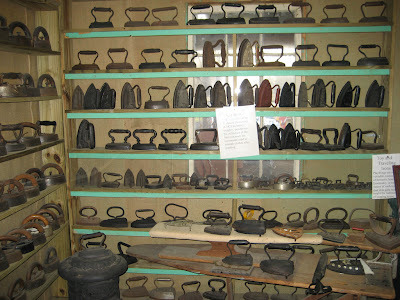 But when no one at that museum returned three weeks worth of calls/emails, I gave up". What does that mean? Is there some process involved other than (1) seeing the show, followed by (2) blogging your thoughts? 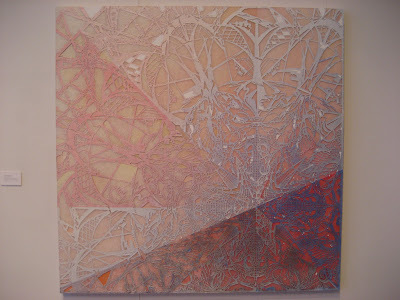 Eleven artists, 43 pieces, 7 sales. Seven artists reporting no sales. 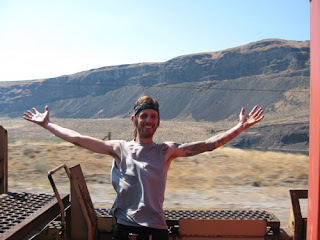 UPDATE: Travis Conner passed away Friday, January 11, 2008. An obituary is posted in the comments. I might make another post later. 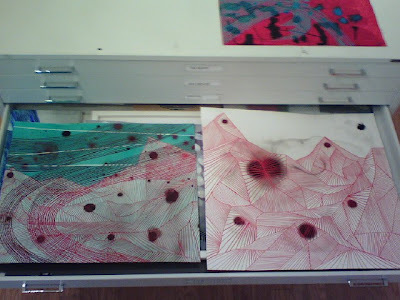 UPDATE: Black Lines, made October 2007. RELATED: Nonesuch will be closing permanently as of February 1st. This was maybe my favorite space in Richmond. 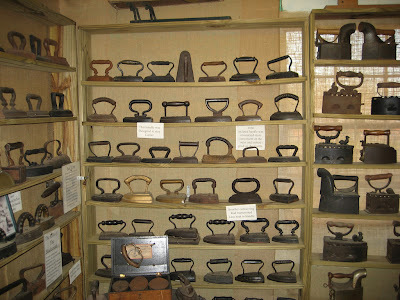 Some beautiful forms... they feel good to pick up. 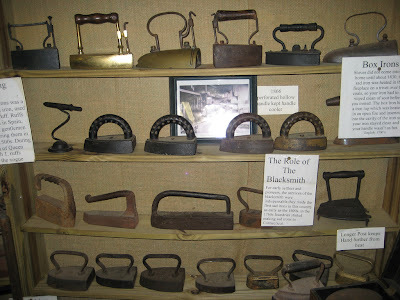 Lots of signs posted talking about the evolution of the iron, all of the different forms and functions. The Iron Man will tell you all about them. HERE is a VIDEO of the Iron Man giving a short tour, talking about some of the different irons. 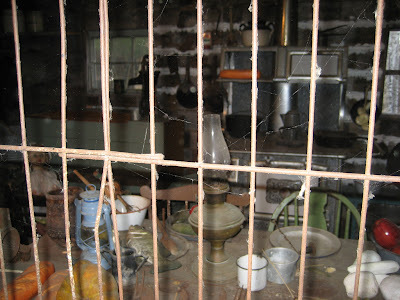 An iron on the stove at left, and an old ironing board. 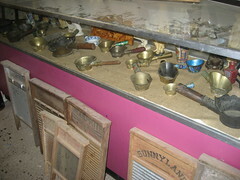 Collection of washboards, and the Oriental Iron case. Click on the picture for a bigger view. 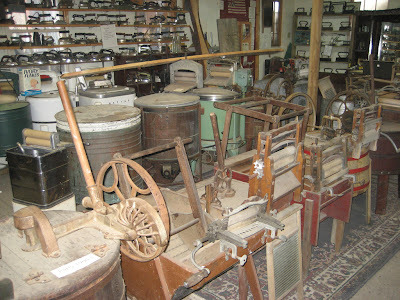 The center of the museum is full of old-style washing machines, starting with the kind you crank your clothes through. George DeMers, aka Iron Man. The Iron Man is, in fact, known as Iron Man amongst two different groups of people for two different reasons. 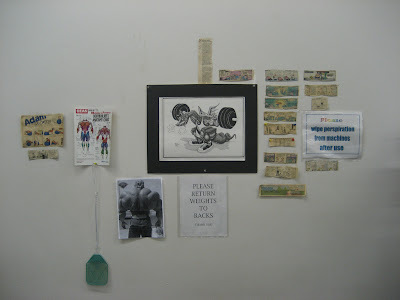 The antiques dealers call him Iron Man because he comes and buys the irons, the guys at the gym call him Iron Man because he is a power lifter. 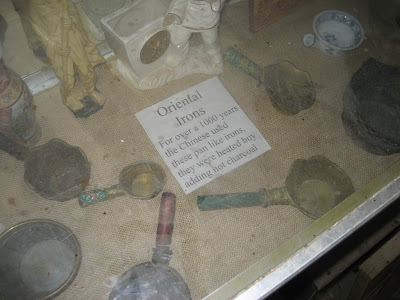 Sadly, the Iron Man is busted and has been forced to sell his entire iron collection at a loss, and is trying to sell his house. He got screwed by the adjustable-rate mortgage thing. 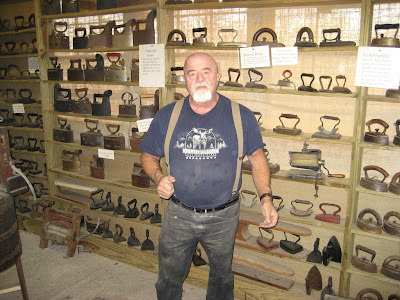 I think he put something like $23,000 into assembling his iron collection, and recently sold it for $7,000. He's only keeping one iron, one of his two favorites. IRON MAN!!! 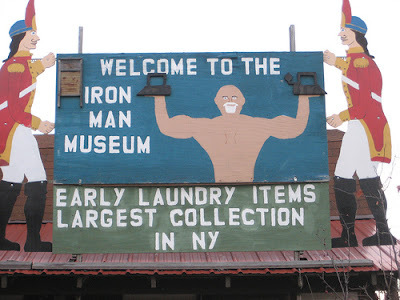 You can see that in this sign the Iron Man is power lifting two irons, flanked by Revolutionary war soldiers. 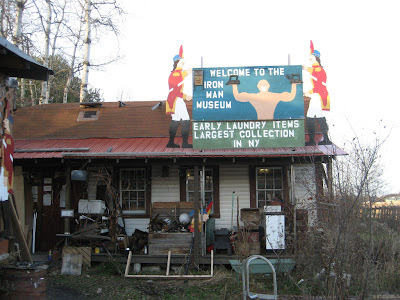 The Iron Man is also very into history and the Revolutionary War (a few battles were fought in the area). This is the Iron Man's re-creation of a Revolution-era kitchen. 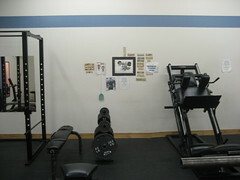 Here's another view. 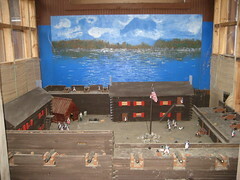 Diorama of a Revolutionary War battlefield. 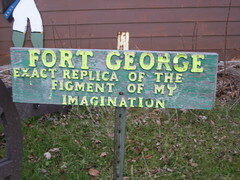 Fort George - Exact Replica of the Figment of my Imagination. Do you want some sturdy folky furniture? George makes furniture, from wood, all sorts of very good sturdy funky folky stuff, kind of Adirondack style. It's CHEAP. He's a got a showroom in another building, and can make special request stuff. 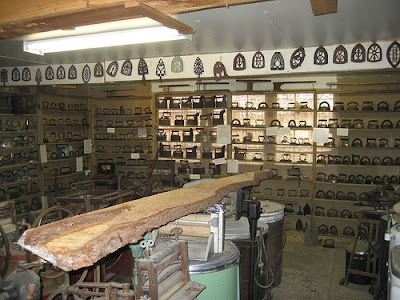 He's in Schuylerville, NY.... check out the website, lots of pictures of his furniture. PLUS: WATCH the Iron Man video. READ the Iron Man newspaper article. 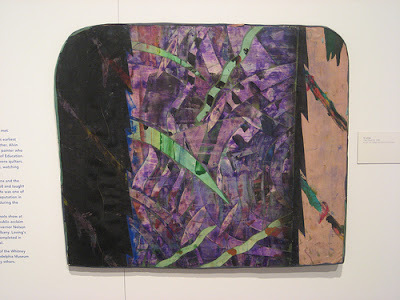 Al Loving, Untitled, 1986, fabric and painted paper collage on stretchers. 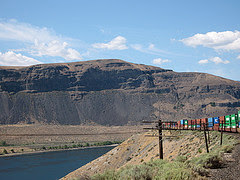 CliCK here, or on the image, to see it larger. 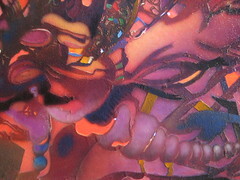 These Lovings, and one more, are included in a small group show at the New York State Museum. 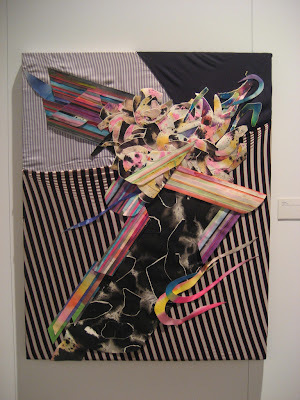 The untitled piece above consists of three pieces of loosely draped fabric over stretchers, topped with a collage of stained and thinly painted cut paper shapes. IT'S PERFECT!!! I'm not sure how the paper construction is attached to the fabric, without pulling it down. 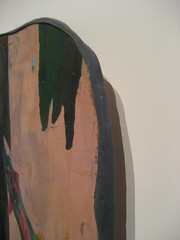 Loving considered himself a "material abstractionist", a term used a lot in Joanne Mattera's recent Miami posts. 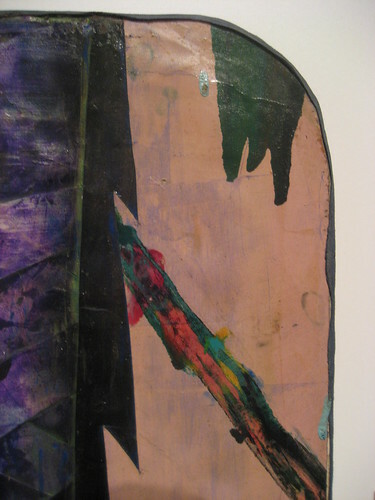 Al Loving, Floyd Street #4, 1985, acrylic, ink, collage and gels on stretchers. 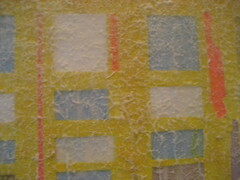 This one is layers of overlapping and painted cut paper applied to some type of panel, and painted over. 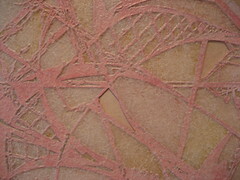 The edges are kind of wobbly, with something soft, like felt, applied all around the sides. All of these people are fellow Yaddo residents, artists and writers, gathered in Elisabeth's studio an hour before dinner. Yaddo is very strict about dinner. 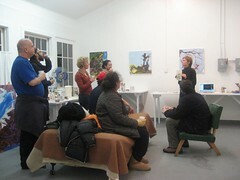 The guy in blue is Elliott Levine, the blonde woman is an artist from Iowa, and Elisabeth is standing on the right, holding up a book. 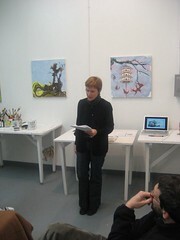 She gave a short talk about her work and influences... she's been inspired by Chinese landscapes and poetry. UPDATE: the blonde artist from Iowa is Laurel Farrin! 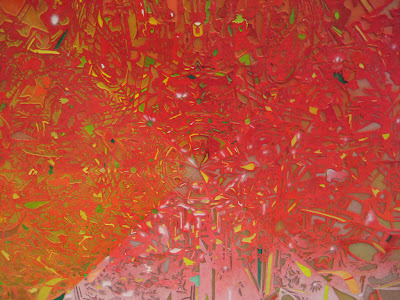 Roland Flexner was mentioned, but I'm forgetting what other specific artists were cited, although considering her work now while looking at these photos I'm thinking a little bit of Max Ernst.... partly because of the discovery of landscape through process. 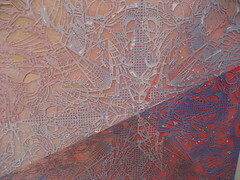 detail from top image. 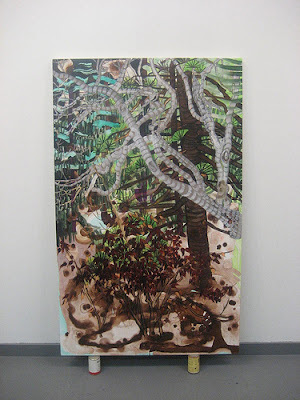 cLicK here to see more studio photos. 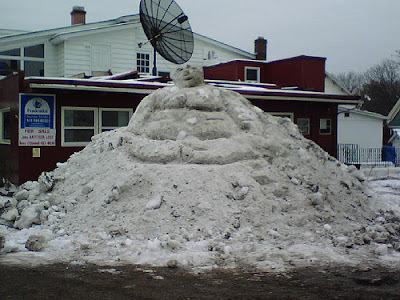 Portsmouth, New Hampshire today. 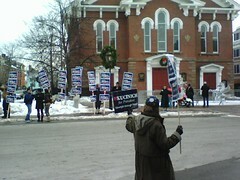 Clinton supporters across the street, Kucinich supporter in foreground. It's wild. Every conversation you overhear, on the streets and in the coffee shops, is about the candidates. Right now I'm in Manchester NH, location of tonight's debates. 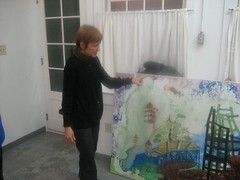 Jennifer Hodges, at Nahcotta, in Portsmouth. 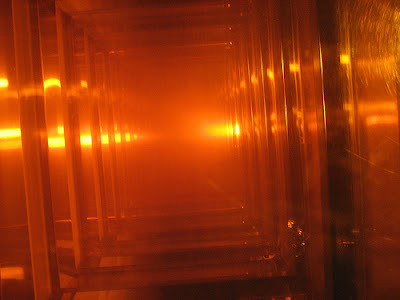 Donald Judd, untitled, 1968, stainless steel and amber plexiglass, at the New York State Museum, in Albany. This is the Donald Judd that Jen Graves was delighted to discover last month, and here is the Conrad Marca-Relli she regrets not getting an image of. De Selby on Tino Sehgal at Marian Goodman. William Powhida is soliciting nominations for his New York Enemy/Ally Project, something for a group show at Schroder-Romero opening next week. - THINK before you submit, because I don't think you can get back into the survey site once you have nominated. I just did it quick to see what would happen, only wrote in one name, and didn't include any reason.... now I can't get back in to add more names or elaborate. Bad at Sports has a podcast interview with Leo Koenig, co-hosted by Tom Sanford. Includes multiple excruciating moments. Joanne Mattera on Martin Puryear at MoMA, with some gorgeous atrium installation photos. 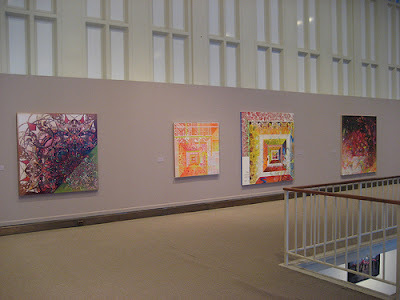 I saw the 1992 retrospective at the Philadelphia Museum of Art (coordinated by John Ravenal)... it made a big impression. The Artist's No-B.S. Market Report got more responders than I had expected over the holidays. Keep commenting, and I'll post the results next week. Uncle Sam statue... WHO is the artist? ... i'm sure there are more.